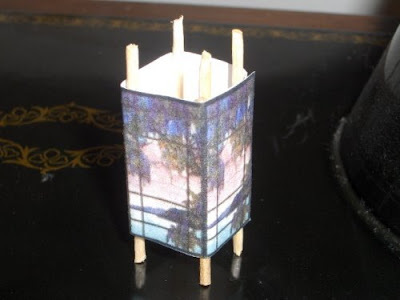 Again, another sweet doll house project from Hitty Print Mini: precious little doll house paper lanterns. We did as suggested on the website and cut off the "paper" sticks which will print out with the lantern. (You'll know what I mean if you look at them on the website.) Instead, we hot-glued toothpicks into place after cutting the ends off the toothpicks with scissors. Okay, time for a disclaimer: Ends of toothpicks are sharp and should not be left on the floor to be stepped on. They can be dangerous. Cut over the trash can so that all sharp pieces go into the trash. Secondly, moms, do the cutting. Not children. Also ALWAYS supervise the use of hot glue guns. They are not for children without supervision. 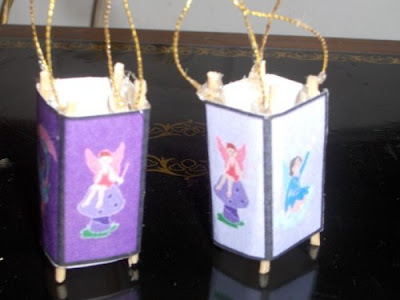 We used just a dab of glue inside each corner to attach our little strings for these two doll house lanterns. They will probably hang up in the dolll house somewhere near the door or in a doll's bedroom. how cool! SO impressive! thanks for visiting me! and good reminder about the sharpness of toothpicks!